Welcome to the MYMOID API! 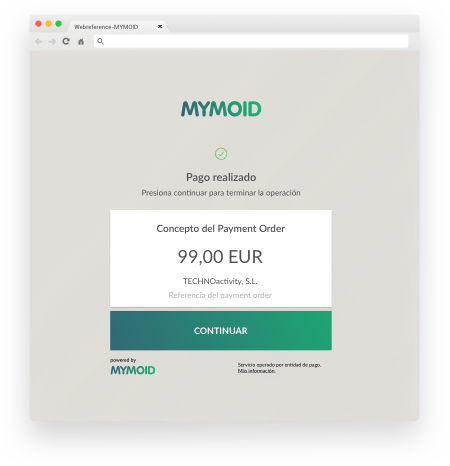 We define how MYMOID’s payment API works throughout this section. This documentation is directed to the development departments of businesses that want to integrate with it. Therefore, it has a technical nature. This guide assumes that your company has been previously registered and that it has the necessary credentials to be able to interact with the payment API. 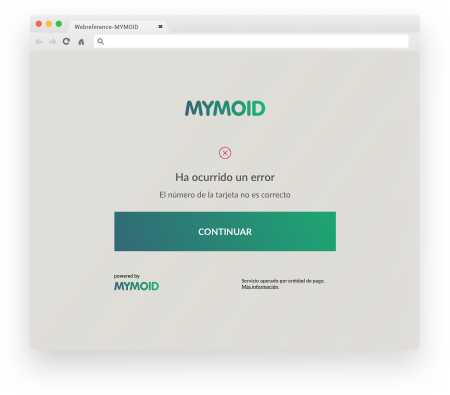 MYMOID’s API consists of an API REST with a series of services secured by unique credentials assigned to each business. Our main concepts are based on the next three entities: Payment Order, Payment Method and Payment. Within the platform these entities interact with each other to carry out the payment process and store the information about it. The entire API is based on the concept of a Payment Order. This Payment Order reflects a payment and the interaction between a business and a client. As such, this document makes constant references to this term, which is defined in more detail in the corresponding section. The Payment Order is the basic information of a payment, the Payment Method represents the information of a payment method, with this two we can make a Payment. Finally the Payment represent the basic information storaged of an already executed Payment Order. 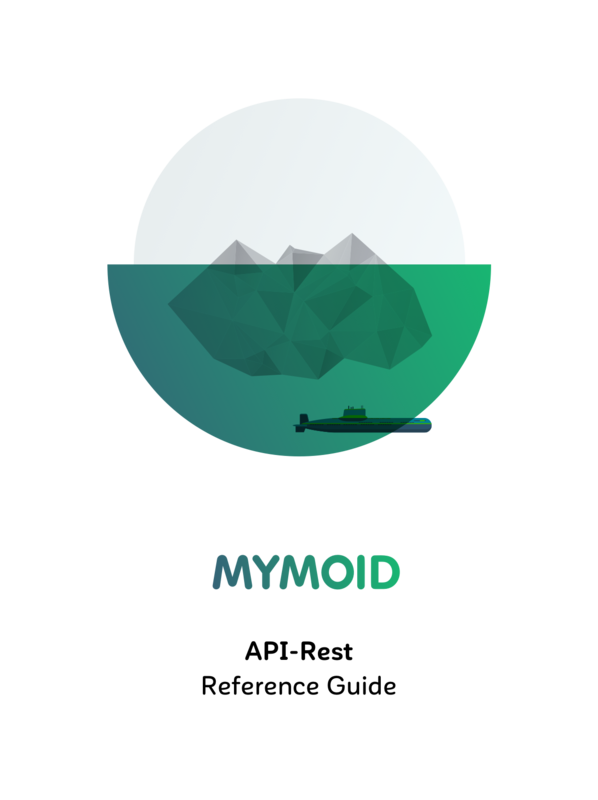 MYMOID’s API has two environments: Sandbox and Production. The Sandbox environment is dedicated to integration trials for new companies. All the requests work the same in both environments, the only detail that changes is the url and the company’s credentials. Once a company has been integrated in SandBox, if all its requests function correctly, they only have to change the credentials and replace the Sandbox environment URL with the Production environment URL. When you create a new merchant in our platform, an application is the entity responsible for storing the credentials and permissions for the merchant. These applications make different credentials with each other that can be configured with special permissions to perform certain types of operations. GENERATION Generate and consult the application Payment Orders. PAY Pay, refund and cancel the application Payment Orders. REUSE Reuse the application already paid Payment Orders. MASTER This permission contain all the permissions listed before and also can operate over all the Payment Orders created for the merchant. Remember that the credentials are private and for personal use. Please do not share these credentials. In order to make a Payment, we first need to create a Payment Order. After creating a Payment Order we can interact with it to perform different types of transactions such as consultation, execution, cancellation or refund. This payment order has two diferent types, this types would decide the flow in the payment. 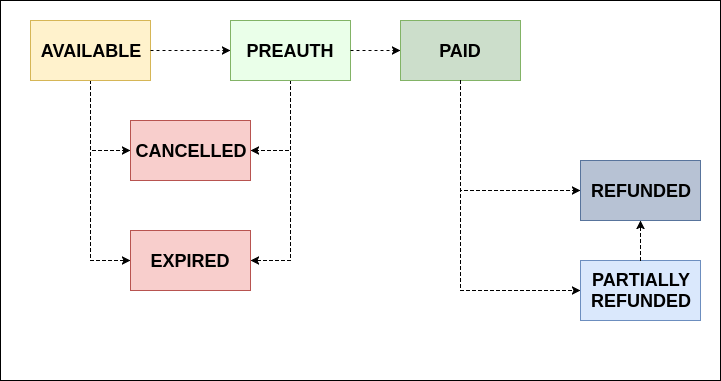 The follow workflows will explain the diference between this two payment types. AVAILABLE The initial status of a Payment Order after it has been created. This Payment Order can be expired, canceled or paid. EXPIRED A Payment Order is expired if the expiry period (24 hours by default) has passed and the payment on it has not been made. Once the Payment Order has expired it cannot be paid. CANCELLED A Payment Order with AVAILABLE status may be cancelled. After we cancelled the Payment Order it cannot be paid. PREAUTH When you Preauthorize a payment order, you are effectively ring-fencing funds in your customer’s bank account in order to confirm the payment later. A Payment Order can only arrive to this status from AVAILABLE. PAID Only after we confirm or excecute a Payment the Payment Order status would be PAID. PARTIALLY_REFUNDED A Payment Order is in this status if we make a refund for an amount less than the total after having been paid. REFUNDED The amount associated to the Payment Order which was previously paid has been completely refunded. To be able to proceed to a refund, the Payment Order must be in PAID or PARTIALLY_REFUNDED status. currencyCode The type of currency associated to the payment order. amount Payment Order’s amount. This should be an integer value (decimals are not accepted) and represents the value in cents. To order a 1 EUR payment order (or any other currency) the value must be 100.
payType Payment Order’s type. The right value for execute a traditional payment should be entered is PAY. But In order to use the preauthorizations you should use ‘PREAUTH’ as a payment order type. status Payment Order’s status (detailed in the payment order section). shortCode Payment Order’s short identifier. merchantId Merchant’s identifier that generate the order. transactionCode Gateway transaction unique identifier. paymentId Identifier of the Payment corresponding to the refund. 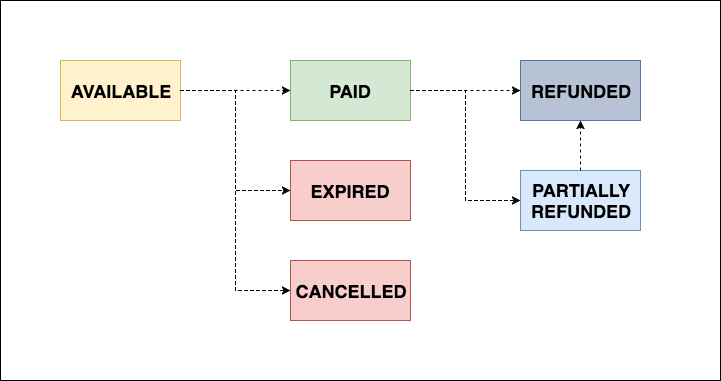 Once you execute a refund a new Payment entity with negative value is created. This new Payment is related to the initial Payment Order. amount Value of the Refund. This amount would be negative in order to represent the Payment Refund. You can find API request and response examples aside. As of this moment, all the operations that we want to make on the payment orders that we have created we will have to indicate the paymentOrderId received at the moment of creating a payment order. This unique, 64-character ID will allow us to indicate at all times which payment order we are working with. It is also important to remember the value returned in the shortCode key. This unique identifier also represents a payment order and we will need it when loading the payment form that we will discuss later. The paymentOrderId is the Payment Order identifier that we want to consult. You can see the response from the API to this request aside. You can find API response aside. Remember: To make this request your merchant must have the corresponding PCI certification and comply with the regulations set forth in the normative. 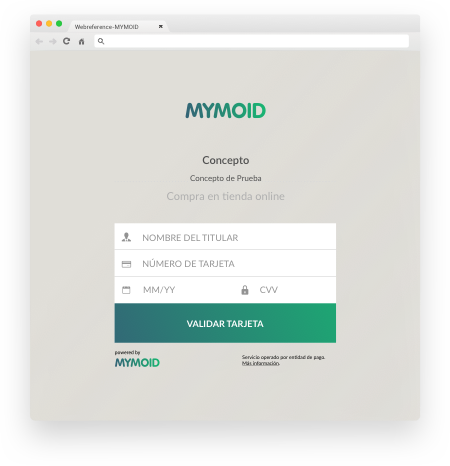 In case of not fulfilling the certification required for this transaction MYMOID provides a Payment Form with which the orders can be executed, please, refer to Payment form documentation to know more about it. To release the previous reserved (authorized) funds it is necessary to execute a cancellation of the payment order, this will return the funds automatically and cancel the payment order. In order to view payment order cancelation, please, refer to Cancelling a Payment Order documentation. After you reserve the funds on the client’s bank account, you should confirm this transaction in order to make it effective (The funds reserved against the client’s bank account will be charged and will be travelling to your merchant account). Once the order is confirmed, the payment order will go to 'PAID’ status. You can’t confirm an order more than once. With the partial refund we have the possibility of refunding an amount less than the amount associated with the Payment Order and make multiple refunds, whenever the refunded amount in total is less than or equal to the total amount of the Payment Order. In this case we indicate the amount to refund. If the amount to refund is equal to the total amount of the payment order, the partial refund would be equal to the total refund. Total refund refunds the entire amount paid in a single request. The advantage of this refund is that we do not need to know the amount paid initially, as we refund the total amount at one time. You can see examples for both types of refunds aside. Notice that in order to get this data the Payment Order has to be paid before making the request. 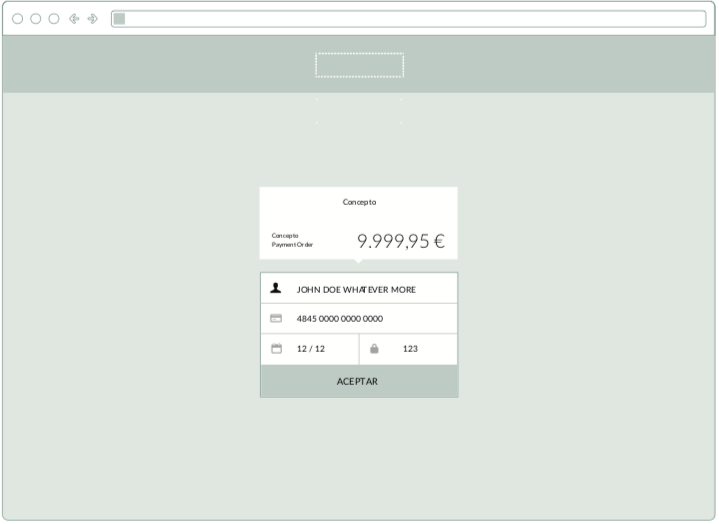 The page where the amount and form are shown allows a basic customization of its elements, based on the presence of a main colour (required) and a second one (optional, for the background and heading). Currently the maximum height size of the form’s content is 702px (on desktop displays) or 450px approx. on mobile portrait displays. The iframe content has been built responsively, so it will fit to the iframe’s width as the webpage resizes. That’s useful to set the width dynamically based on a percentage or setting it with a css media query. with shortCode as the identifier returned when creating the Payment Order. Once the client enters the card’s details, they will be redirected to the corresponding result screen. Users can be redirected to specific URLs through a continue button once the Payment operation has been finalized and depending on its result. To do so, we have to configure some parameters in the form’s URL, as shown in the following examples. In both the url ok and ko you can send all the parameters that are necessary to continue the flow of Payment within your environment, that is to say, you can make use of parameters within the URLs sent. One of the most interesting possibilities of this function is the capability to store a Payment Method without the need to make any charge on it. To do so we will create a Payment Order for an amount of 0 EUR (or whatever other currency), then we will load its associated payment form and we will enter into it the payment method. In this case, no charge is made on the Payment Method entered. It simply validates that its information is correct, as such the form does not show the amount of the Payment Order. If the Payment Method is valid, the Payment Order will appear as paid and we can reuse it as many times as we want in order to reuse the Payment Method stored. The reuse is based on the same functionality as reissue. Its finality is to reuse a Payment Method already registered on our platform through a Payment Order already executed. The main difference with the previous method is that to execute a reuse its necessary to have two Payment Order identifiers, one from an order in AVAILABLE status and another from an order with PAID status. This request reuses the Payment Method used to pay the first Payment Order (field: OriginalpaymentOrderId) to pay the Payment Order in AVAILABLE status (field: paymentOrderId). In order to reuse a Payment Method you have to make sure that you are using the credentials provided with this specific permissions. You can check the permissions list in the Basic concepts - Application section. To use this type of Payment it is necessary to register a Reference in our platform, to which we associate Payment Methods. With the identifiers of the Payment Methods registered we can execute the Payment of our Payment Orders. This kind of integration provides you a mayor control about the Payment Methods. referenceId Identifier of the Reference. value The value of the Reference. This value can be use to identify our Reference in our system and create a relation between both platforms. deleted Represents wether the Reference is still active. holderName Payment Method holder’s name. alias Payment Method’s custom name. defaultPaymentMethod Default Payment Method for the reference. expirationDate Registered Payment Method’s expiration. expirationDateStr Registered Payment Method’s expiratio, parsed to ISO 8601.
creditCardType Credit card’s type. This value may be VISA or MASTERCARD. expired Represent if the Payment Method has expired. verified Represent if the Payment Method has been verified. firstNumbers PAN number’s first six numbers. lastNumbers PAN number’s last four numbers. After creating the Reference, you receive a unique identifier for the Reference. This field is used to manage the Payment Methods registered and related to this Reference. Notice that the field ‘value’ sent to the API could be used to establish a relation between our Reference identifier and your user identifier. This is a great tool that allows you to store, manage and use the Payment Methods taken from your users. This list shows you all the active References created for your merchant and their unique identifiers, with which you can interact with the API to obtain information about the Payment Methods registered for each one of them. Once you delete the Reference, all the registered Payment methods’ information is destroyed, so please make sure this information is not going to be needed before deleting the Reference. Each Payment Method registered belongs to a specific Reference. In order to make Payments with these Payment Methods it is necessary to send the Reference owner of the Payment Method. For security reasons when you register a new Payment Method, automatically, both verification and validation process are executed. In order to avoid the automatic verification process you can send the “verify” field to false. Please, refer to the next section in order to know how to complete this process (Payment Method verification and validation process). This validation will check the authenticity of the data provided on the Payment method enrolment like PAN, expiration date and cvv. In order to execute a payment, the Payment Method must be validated. When you add a payment method, the cvv information on the Add Payment Method to a Reference request is optional. If you send the cvv on payment method enrolment this will be automatically validated, but if you dont the payment method will remain 'unvalidated’ and you will have to use the validation process in order to achive this authentication. When the verification process is starded, we’ll send a charge to the user’s bank account, this charge is made in order to verificate the Payment Method holder. Once you verificate the Payment Method this charge would be refunded. In order to start a verification process you can either make use the field verify set to true when Add Payment Method to a Reference, or you can use the method start a verification procces to start this process separately from the Payment Method enrolment. After that, make use of the Verify Reference Payment Method request to end this process. "message": "Payment Method validated correctly"
"message": "Verification Process started correctly"
"message": "Payment method successfully verified." Notice that this time a field 'amount’ should be added in addition to PaymentMethodId and ReferenceId. This field represents the value in cents of the charge made to the Payment Method. On sandbox environment we will use a default value for this verification set to “64”. Please, to know how to register a Reference and add a Payment Method to it, refer to Reference section. Notice that in order to pay a Payment Order with a Reference, the Payment Order and the Payment Method registered must be owned by the same merchant. This operation will show all the public information registered for a specific PaymentMethodId. As we mentioned before, a single Reference can storage many Payment Methods. With this request you can list all your Payment Methods so that you can get their Payment Methods to manage them. The only field that can be modify after adding a Payment Method is the custom name sent in the 'alias’ field as you can see in the section aside. "message": "Payment method successfully deleted." Once you delete the Payment Method, you will lose control of the information that you registered for the Payment Method, so please double check this information is not going to be used in advance before deleting the Payment Method. In this section we will describe Payment errors returned by the API. When you try to execute a payment a transaction between mymoid and the payment processor is made. If this transaction is denial by the processor we will provide you the infomation about the error code we receive from it, included in the “processor” section of the json sent to your system. Woldpay error documentation. You can find all the errors descriptions availables under the label “ISO 8583 response codes”. Redsys error documentation. On page 22 you can find a detailed explanation about redsys errors (Only spanish). In this section we will describe notifications sent from MYMOID to merchants. We have two kinds of notifications: email and webhook. The email notification sends information once a payment is made using MYMOID platform. The webhook notification gives merchant information about a payment operation even if it has failed. As the email notification is enough descriptive by itself, we are going to describe more in detail the webhook notification below. 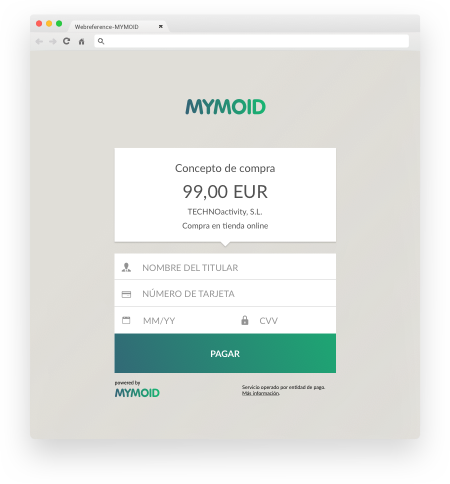 After making a payment attempt, MYMOID creates a callback request to Merchant’s webhook URL. Callback messages contain payment related information and their sent event if the payment process fails. To ensure callback authenticity, MYMOID applies an electronic sign process to the most important fields of the message. Merchant can use the method described below for ensuring callback origin. MYMOID uses a RSA public key scheme for signing webhook message content. We apply “SHA-256 signing algorithm with RSA encoding as defined in the ‘OSI Interoperability Workshop’ following PKCS #1 conventions”. Resulting signature is Base64 encoded and included in the webhook message under 'signature’ attribute. You could ask for sandbox and production certificates in order to ensure webhooks authenticity.